We are all familiar with the home shopping network and the wonderful array of fine quality items available for purchase right from the comfort of your own overused sofa. I’ve never given much attention to these kinds of stations, save the occasional mockery, but that has recently stopped. I’m somewhat enthralled by a fairly new shopping show call “Knife Show”. I actually started watching it as a “goof” feigning interest to my wife and making fun of the red-necks that devote an entire, multi-hour show to nothing but knives. However, as I watched it several times, probably because this show seems to be on almost every night, I started to be entertained. The show itself has evolved along with my feelings about it. The first few times I watched it, I was amazed at how such horrible dialogue and camera work could be on anything other than public access, but I have to admit, it has gotten a little better. That being said, the informal nature of the show is sure to keep you smiling as it is definitely the “B-Horror film“ equivalent of home shopping. Joe is bar far my favorite redneck host. He doesn’t bother with things like professional looking clothing or often, even the formality of sleeves, and he is definitely unafraid of mixing bathroom humor with his sales pitch. He lulls you into buying cutlery using his strongest southern drawl and colorful descriptions. For instance, he would never sell you a red folding knife. He would offer a “crimson-bone, tactical folder”. He wouldn’t sell a broadsword, he would show you “the Nightstalker, a Medieval, folded steel, claymore with oyster shell grip and herring bone inlays”. Now with a description like that, you would expect to pay $1000 to $1500, but I say nay-nay, on Knife show, its probably around eight bucks. Interestingly enough, they have started selling groups of knives. Now I don’t mean a set of eight to ten, I mean one hundred to two hundred knives in a massive lot. Before watching this show, it had never occurred to me that I might want to buy a lot of 200 knives, but wow, they do make it look attractive. 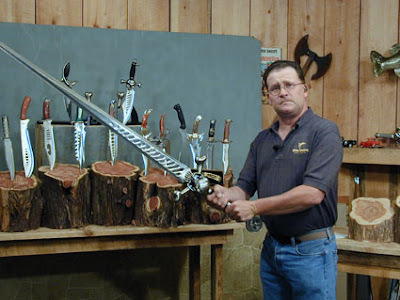 Most of the large lots have a average knife cost of less than one dollar, and they usually have swords and bowies and flip-locks and wildlife series and …….well, you get the picture. There’s a whole lotta knives for not that much cash. I can’t envision what I would do with that many knives, but I really want to buy some. I even called them once thinking that shipping was where they made back all their money. I mean, how can you sell any knife for less than a buck, let alone the “Dragon Warrior” and the 3-piece Daisho set? A small Tanto alone should fetch $2-$3 alone on the open market, one would think. Well, I called and the shipping on 200 knives was only about $30. What is going on here? How do they do it? If they were made of cardboard, they should still cost more. Hence my intrigue. I give “Knife Show” 2 stars for mild redneck entertainment. They may seem like dullards on the exterior, but the fact that I am very close to pulling the trigger on a set of 30 3” tactical folders, 25 4” flip-blades, 15 Legends of Nascar series pocket knifes, a Samurai sword, an 18” Bowie, and a bone saw set must mean they are doing something right. For that I give another star. If they throw in a black pearl straight razor and a Dr.‘s knife combo set…I’m sold. Before shaving, one should know what razor is good for his skin. Razors are something personal and it is up to the user what type of razor would give him the closest shave possible, but of course, with less nicks and cuts.